Isle of Wight based Solution Provider and Software Development Company MyCRM, has today announced its next release to market (RTM) of its powerful and advanced activity planning solution. ePlanner builds on an extended framework from the first release but now incorporates the ability to create unlimited planners and set security for team members, along with views for each of the individual planners. The security in ePlanner continues to follow the Microsoft® Dynamics CRM/365 security model. 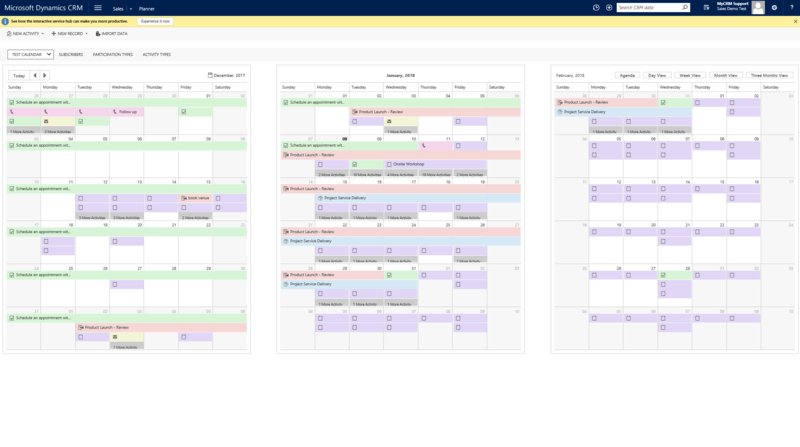 The MyCRM ePlanner solution is unique in the ability to create multiple planners which supports every Microsoft® Dynamics CRM/365 activity type including custom activity types created. MyCRM have a range of solutions that plug-in to Microsoft® Dynamics CRM/365 through its Download Centre https://downloads.mycrmgroup.com/. MyCRM have a development plan over the next 24 months to deliver a range of new and improved offerings which will enhance the user experience of Microsoft® Dynamics CRM/365. MyCRM is now in its 9th year of trading and has seen continued growth and profits. We continue to innovate, design and work with customers around the globe to offer a unique friendly and honest service. If you would like to find out more about MyCRM or attend any of our webinars, follow the links below http://www.mycrmgroup.com/webinars.